The job of an Account Officer is to administer the financial performance of an organization; the job template of an account officer includes certain key tasks such as ascertaining the financial risks, preparing budgets, promoting products and services and making sure that the payments are made promptly. The Accounts officer should disburse the responsibilities with utmost efficiency, accuracy, and precision, an account officer needs to possess computer proficiency, managerial skills and be loyal to the employers. To secure a job as an Account Officer, a person must possess a Bachelors degree in Accounting or its related field. 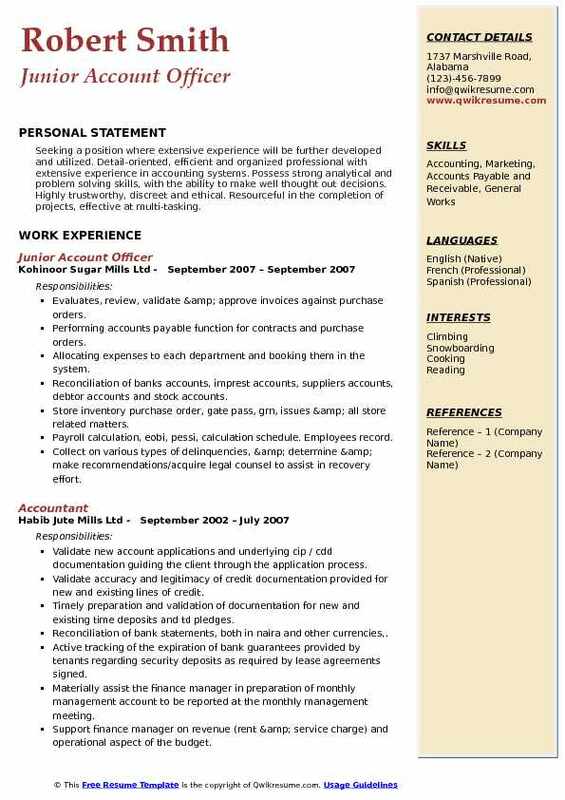 Normally the hiring companies prefer to hand over this position to the best Account Officer Resume Sample that depicts an MBA with few years of experience. 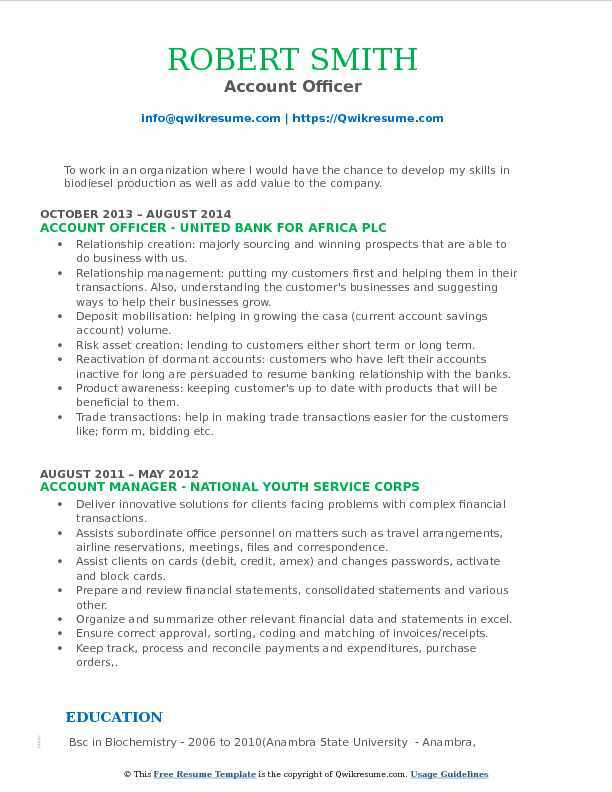 Summary : Business banking professional with over ten years of banking experience and five years of management experience. Determined to exceed sales goals and build long term relationships with customers while maintaining sound banking practices. Seeking a position within Business Development where my experience and qualifications will assist in its success and growth. A self-motivated, hardworking, team player that excels in a deadline driven and fast paced environment. Support RM in the acquisition of new business relationships and the active management and retention of approximately 200 south. Support RM in growing top clients in business portfolio by providing exceptional customer service and implementing effective. Schedule face to face meetings with clients to discuss any pending matters from a compliance perspective and discuss referral product. Process the daily overdraft report, prepare compliance status reports, and process special projects. Coordinate and obtain required documentation updates for accounts that are subject to periodic due diligence reviews. Develop business trips: visit clients, visit potential clients (traveled to ecuador). Account maintenance for inquiries related to authorized signatures, beneficiaries, closing procedures and/or rms request, amongst. Ensure that all documentation is current and in conformity with bank secrecy act & anti money laundering, ensuring adherence to Agency's policies and procedures, regulations and sound banking practices. Objective : A challenge filled role in an organization, where I am able to display my capacity in line with best industry practice for material excellence and continuous improvement of the organization as a system. 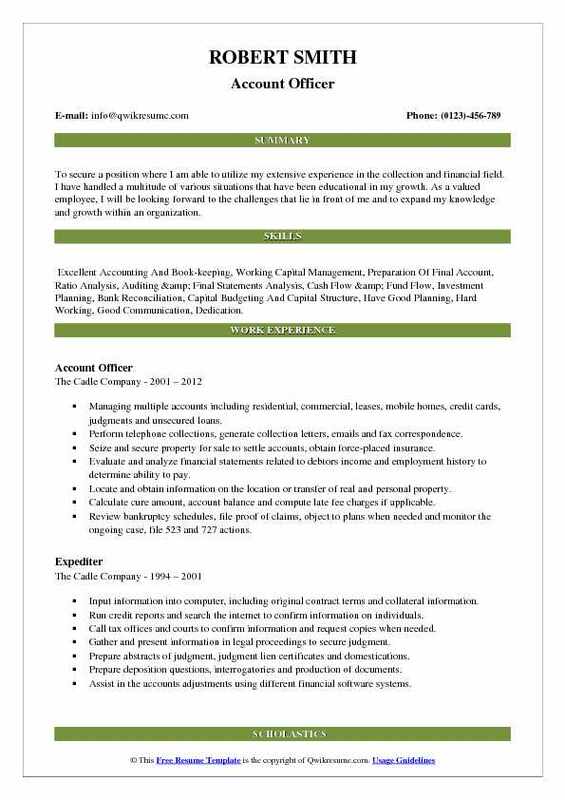 Skills : Possesses Excellent Verbal And Writing skills, Ability To Prioritize And Strategize among many tasks, Apt To Carryout Significant Research For Strategic Consumption, Ability To Use Microsoft Word, Excel And Outlook, Peachtree Package. Capturing approved invoices on the general ledger, taking cognizance of the vat payable and wht to be deducted on each invoices where applicable. Preparation of cheques/bank instructions for actual settlement of suppliers invoices that is due for payment. Maintaining relationship with suppliers on the status of their invoices, and with bank officers on payment instructions sent or cheques issued for clarification. Update the schedule of wht payable for timely and accurate remittance to firs and or lirs. Notifying suppliers of pick-up of their respective wht credit notes received from tax authorities. Periodic preparation of tenants invoices (service charge, lease deposit, signage, utility, etc. ),. Update the schedule of vat and wht receivable and the actual entry into the bespoke erp: broll-online. 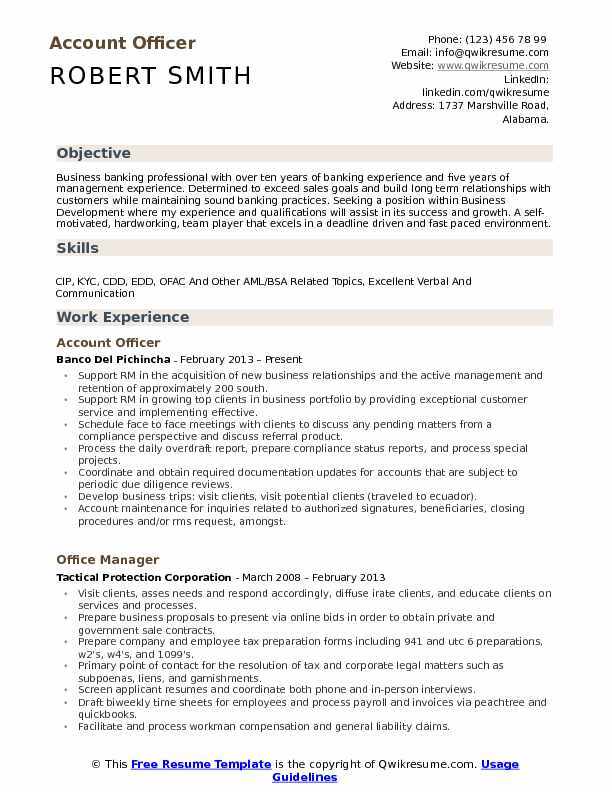 Summary : To secure a position where I am able to utilize my extensive experience in the collection and financial field. I have handled a multitude of various situations that have been educational in my growth. As a valued employee, I will be looking forward to the challenges that lie in front of me and to expand my knowledge and growth within an organization. 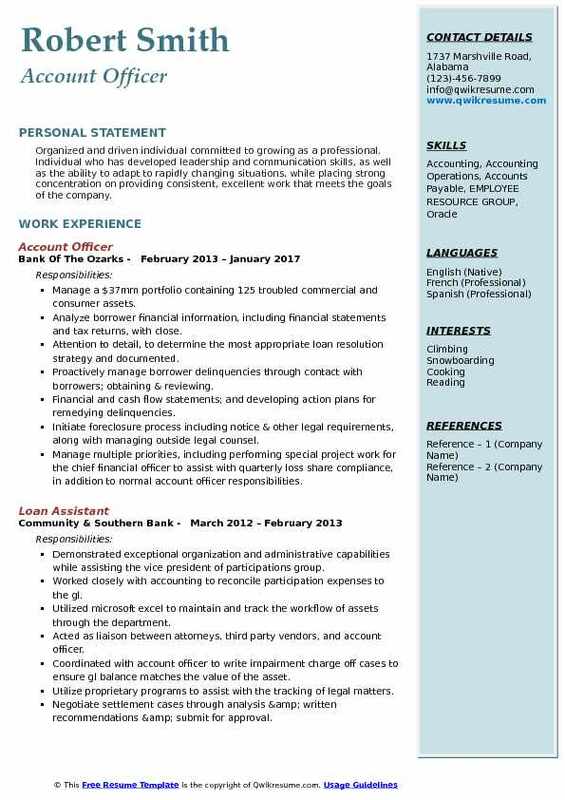 Skills : Excellent Accounting And Book-keeping, Working Capital Management, Preparation Of Final Account, Ratio Analysis, Auditing & Final Statements Analysis, Cash Flow & Fund Flow, Investment Planning, Bank Reconciliation, Capital Budgeting And Capital Structure, Have Good Planning, Hard Working, Good Communication, Dedication. Managing multiple accounts including residential, commercial, leases, mobile homes, credit cards, judgments and unsecured loans. Perform telephone collections, generate collection letters, emails and fax correspondence. Seize and secure property for sale to settle accounts, obtain force-placed insurance. Evaluate and analyze financial statements related to debtors income and employment history to determine ability to pay. Locate and obtain information on the location or transfer of real and personal property. Calculate cure amount, account balance and compute late fee charges if applicable. Review bankruptcy schedules, file proof of claims, object to plans when needed and monitor the ongoing case, file 523 and 727 actions. 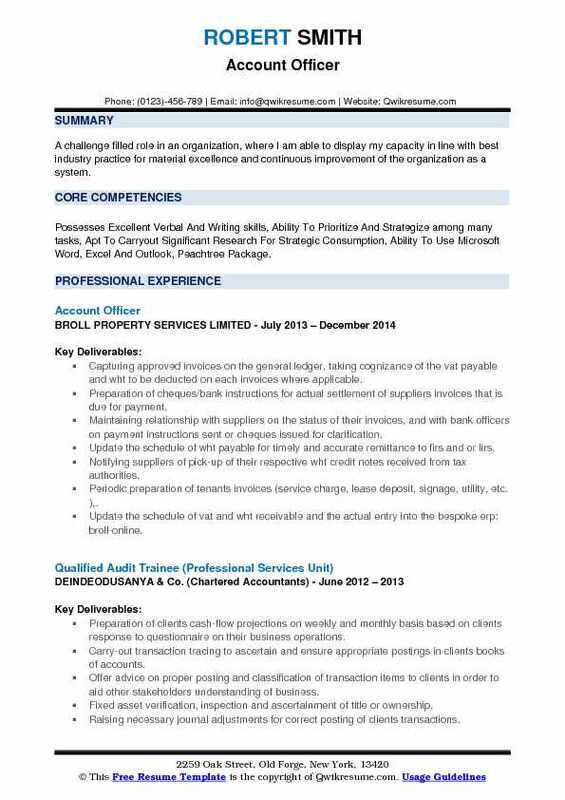 Objective : Quality focused Account Officer with 3 years of experience in handling confidential tasks and making routine office task as efficient as possible. Providing excellent client service skills and maintain efficiency in all day-to-day operations. Skills : Phone Etiquette, Database Management, Customer Service, Data Archiving, Ability To Organize And Prioritize Tasks. Screens applicant and review their documents to be forwarded to the manager for the approval. Enter client's details on the database for future reference and loan processing. Performs background check of the clients to ensure of client's good reputation and capacity to pay for the loan. Encode loan releases and label the arch file according to country and volume. Maintain and update filing, mailing, and database systems, either manually or using a computer. Communicate with customers, and other individuals to answer questions, disseminate or explain information, take orders, and address complaints. Compile, copy, sort, and file records of office activities for future references, business transactions, and other activities. Objective : Organized and driven individual committed to growing as a professional. Individual who has developed leadership and communication skills, as well as the ability to adapt to rapidly changing situations, while placing strong concentration on providing consistent, excellent work that meets the goals of the company. Manage a $37mm portfolio containing 125 troubled commercial and consumer assets. Analyze borrower financial information, including financial statements and tax returns, with close. Attention to detail, to determine the most appropriate loan resolution strategy and documented. Proactively manage borrower delinquencies through contact with borrowers; obtaining & reviewing. Financial and cash flow statements; and developing action plans for remedying delinquencies. Initiate foreclosure process including notice & other legal requirements, along with managing outside legal counsel. Manage multiple priorities, including performing special project work for the chief financial officer to assist with quarterly loss share compliance, in addition to normal account officer responsibilities. Collaborate across teams, including accounting and oreo department to help achieve common goals. Headline : Involving continuously in accounting professional with more than 6 years of experiences in recording, categorizing and summarizing of financial transactions and events with teaching experience in Nepal. 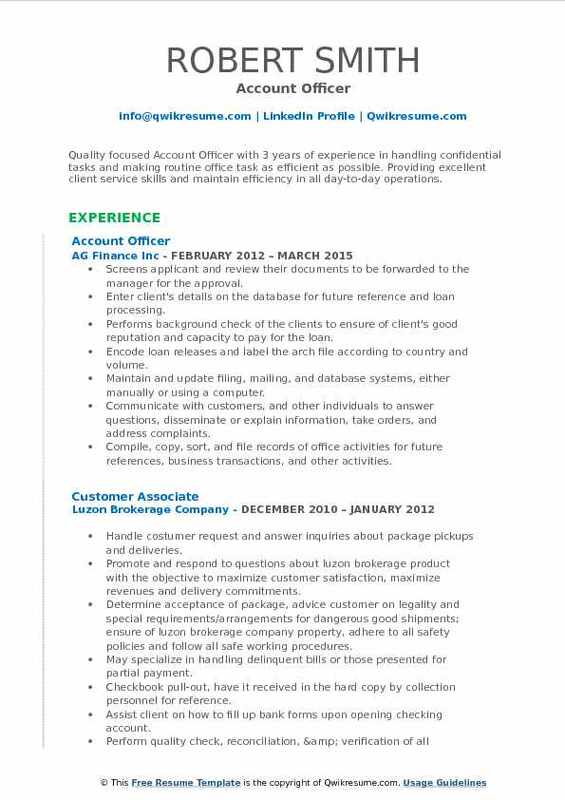 Skilled in handling accounting software such as Tally, Quick books and Peachtree. 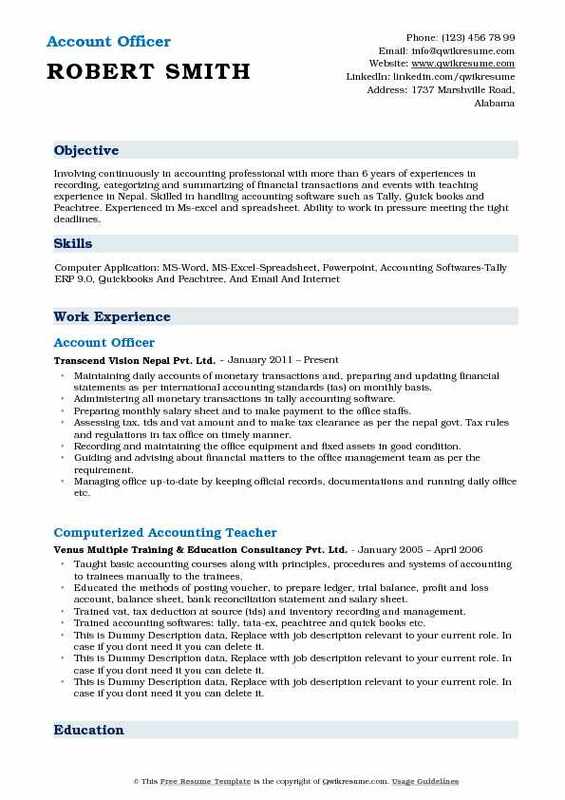 Experienced in Ms-excel and spreadsheet. Ability to work in pressure meeting the tight deadlines. Maintaining daily accounts of monetary transactions and, preparing and updating financial statements as per international accounting standards (ias) on monthly basis. Administering all monetary transactions in tally accounting software. Preparing monthly salary sheet and to make payment to the office staffs. Assessing tax, tds and vat amount and to make tax clearance as per the nepal govt. Tax rules and regulations in tax office on timely manner. Recording and maintaining the office equipment and fixed assets in good condition. Guiding and advising about financial matters to the office management team as per the requirement. Managing office up-to-date by keeping official records, documentations and running daily office etc. 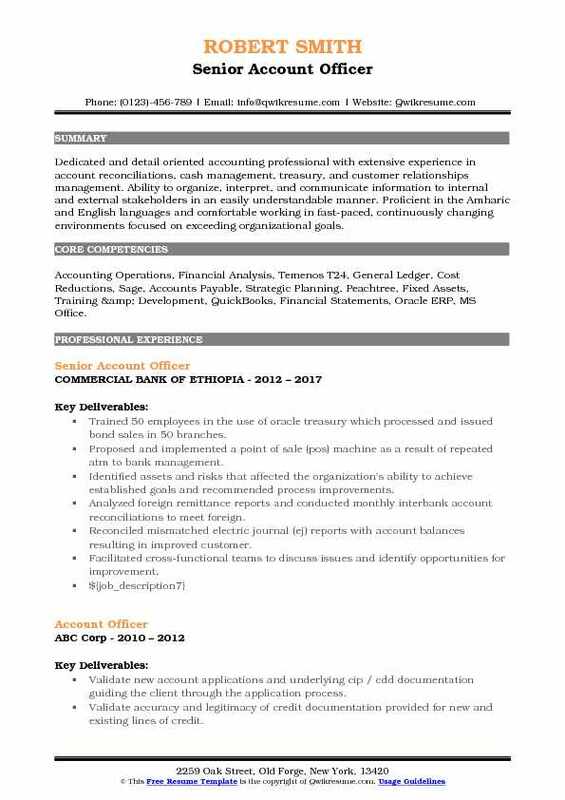 Objective : To work in an organization where I would have the chance to develop my skills in biodiesel production as well as add value to the company. Relationship creation: majorly sourcing and winning prospects that are able to do business with us. Relationship management: putting my customers first and helping them in their transactions. Also, understanding the customer's businesses and suggesting ways to help their businesses grow. Deposit mobilisation: helping in growing the casa (current account savings account) volume. Risk asset creation: lending to customers either short term or long term. Reactivation of dormant accounts: customers who have left their accounts inactive for long are persuaded to resume banking relationship with the banks. Product awareness: keeping customer's up to date with products that will be beneficial to them. Trade transactions: help in making trade transactions easier for the customers like; form m, bidding etc. Summary : Dedicated and detail oriented accounting professional with extensive experience in account reconciliations, cash management, treasury, and customer relationships management. Ability to organize, interpret, and communicate information to internal and external stakeholders in an easily understandable manner. Proficient in the Amharic and English languages and comfortable working in fast-paced, continuously changing environments focused on exceeding organizational goals. Skills : Accounting Operations, Financial Analysis, Temenos T24, General Ledger, Cost Reductions, Sage, Accounts Payable, Strategic Planning, Peachtree, Fixed Assets, Training & Development, QuickBooks, Financial Statements, Oracle ERP, MS Office. Trained 50 employees in the use of oracle treasury which processed and issued bond sales in 50 branches. Proposed and implemented a point of sale (pos) machine as a result of repeated atm to bank management. Identified assets and risks that affected the organization's ability to achieve established goals and recommended process improvements. Analyzed foreign remittance reports and conducted monthly interbank account reconciliations to meet foreign. Reconciled mismatched electric journal (ej) reports with account balances resulting in improved customer. Facilitated cross-functional teams to discuss issues and identify opportunities for improvement. Objective : Seeking a position where extensive experience will be further developed and utilized. Detail-oriented, efficient and organized professional with extensive experience in accounting systems. Possess strong analytical and problem solving skills, with the ability to make well thought out decisions. Highly trustworthy, discreet and ethical. Resourceful in the completion of projects, effective at multi-tasking. Evaluates, review, validate & approve invoices against purchase orders. Performing accounts payable function for contracts and purchase orders. Allocating expenses to each department and booking them in the system. Reconciliation of banks accounts, imprest accounts, suppliers accounts, debtor accounts and stock accounts. Store inventory purchase order, gate pass, grn, issues & all store related matters. Payroll calculation, eobi, pessi, calculation schedule. Employees record. Collect on various types of delinquencies, & determine & make recommendations/acquire legal counsel to assist in recovery effort. Process adjustments to accounts which include settlements, waiving past interest, reducing interest, charging off balances due to bankruptcy discharge that require a written case & approval. 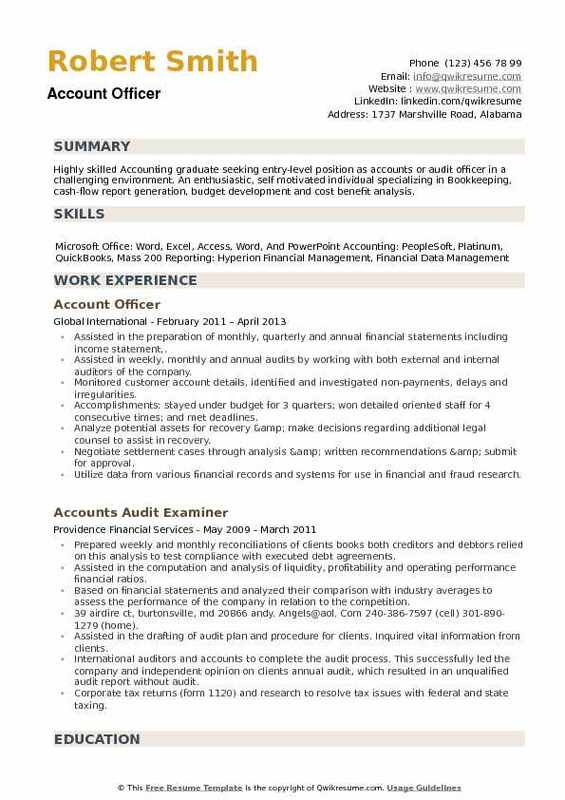 Summary : Highly skilled Accounting graduate seeking entry-level position as accounts or audit officer in a challenging environment. An enthusiastic, self motivated individual specializing in Bookkeeping, cash-flow report generation, budget development and cost benefit analysis. Assisted in the preparation of monthly, quarterly and annual financial statements including income statement,. Assisted in weekly, monthly and annual audits by working with both external and internal auditors of the company. Monitored customer account details, identified and investigated non-payments, delays and irregularities. Accomplishments: stayed under budget for 3 quarters; won detailed oriented staff for 4 consecutive times; and met deadlines. Analyze potential assets for recovery & make decisions regarding additional legal counsel to assist in recovery. Negotiate settlement cases through analysis & written recommendations & submit for approval. Utilize data from various financial records and systems for use in financial and fraud research.